Arunachal Pradesh PSC Recruitment Notification 2017: A career notification is released by the officials of the Arunachal Pradesh Public Service Commission (APPSC). Offline Applications are invited from all the eligible candidates to fill up total 111 Medical Officer Positions in that 108 Posts for Allopathy and remaining 03 openings for Ayurveda positions. So aspirants those who are willing to apply they must submit their prescribed application form through offline before the closing date. Therefore as per officials notification, the last date for filling application is 09-08-2017. Candidates can refer the below provided steps to submit the application form for Arunachal Pradesh PSC Medical Officer Recruitment 2017. Check the eligibility before going to apply for APPSC Medical Officer Positions so that you can know about the educational qualification and age limit. Read this page to know detailed info regarding this Arunachal Pradesh PSC Recruitment. The application fee to fill the Arunachal Pradesh PSC Medical Officer application form is applicable as per official recruitment notification which is released on its official website. Aspirants who are belonging to the General Category have to pay the Application fee of Rs. 180/- while the APST Candidates have to pay an Examination amount of Rs.120/-. Want to get placed into the Arunachal Pradesh PSC organization at first you have to apply for this recruitment then you need to clear all the recruitment rounds. The Written Exam And Viva Voce are the selection rounds as per Arunachal Pradesh PSC Medical Notification 2017. 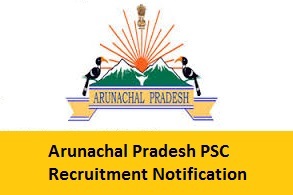 Follow us to get more details about the Arunachal Pradesh PSC Recruitment. Candidates those who got a job in Arunachal Pradesh Public Service Commission as a Medical Officer then they will get the monthly salary of Rs. 15600/- to Rs. 39100/- per month with grade pay of Rs.5400/-. To know and confirm the salary details read the official employment Arunachal Pradesh PSC Medical Officer Recruitment Notification. Allopathy Medical Officer: Aspirants who are willing to apply for Allopathy posts they should have a recognized medical qualification included in the first or second schedule or part-II or third schedule of the Indian Medical Council Act 1956. Ayurveda Medical Officer: Candidates must possess a recognized medical qualification in Ayurveda included in the second, third & Fourth Schedule to the Indian Medical Central Council Act 1970 are minimum educational qualifications for aspirants who going to apply for Ayurveda Posts. Applying aspirants should not exceed the 30 years as on 09-08-2017. Check the official notification to get the details about the age limit and other details about the age relaxation. By clicking the below given links you can directly download the official recruitment notification of the Arunachal Pradesh PSC Medical Officer Posts. The below given info is about the application fee to fill the Arunachal Pradesh PSC Medical Officer application form. Go through the below sections of this page to get category wise details. Want to get placed into the Arunachal Pradesh PSC organization at first you have to apply for this recruitment then you need to clear all the recruitment rounds. The Written Exam And Viva Voce are the selection rounds as per Arunachal Pradesh PSC Medical Notification 2017. Follow us to get more details about the Arunachal Pradesh PSC Recruitment. Visit the official website of the Arunachal Pradesh Public Service Commission i.e., www.appsc.gov.in. On home page find Arunachal Pradesh PSC Recruitment Notification 2017. To know the eligibility read the notification carefully or go through this page to get important details. All eligible applicants click on apply link. Fill all the fields and upload required documents which are stated in the official notification. Submit the application form on or before the last date 09-08-2017.